Why is Google saying that I'm only a 3-star hotel? 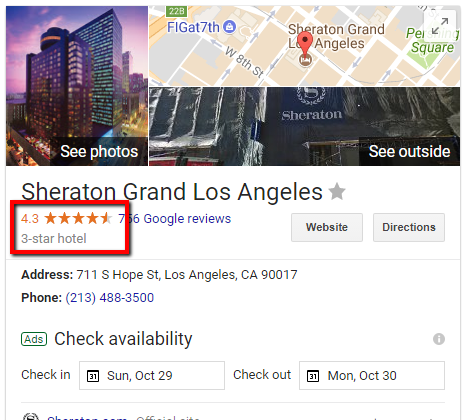 Your reviews say that you're rated 4.3 stars but why is Google calling you a 3-star hotel? The 3-star hotel classification is part of what Google Maps calls the "place label". The important detail here is that the classification assigned in your place label is separate from the overall star rating from your reviews. It's completely possible for a 5-star hotel to have poor reviews, as it is possible for a 3-star hotel to have 5-star reviews from guests. So what classifies a property as a 3-star, 4-star, or 5-star hotel? Smarter Travel explains that there is, "no one-size-fits-all measurement to rate a hotel’s value, amenities, and overall potential for customer satisfaction," but provides a great breakdown of hotel star ratings for major OTAs. Hotels.com goes so far as to provide a detailed description of how they determine hotel star ratings. You'll notice that amenities play a very large part in how hotels are rated. If you don't offer 24/7 room service, heated pools, a fitness center, and en-suite Jacuzzis, then you're likely not eligible to be classified as a 5-star hotel, regardless of how good your guest reviews are. If you have a verified Google My Business listing, you can manually update your property's amenities to help make sure that Google has all the correct information regarding your business. 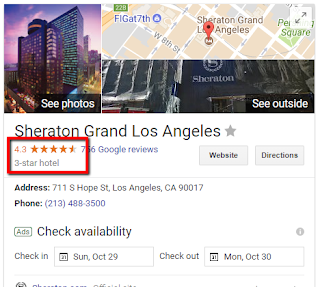 If you've updated your Google My Business listing but still not seeing the appropriate hotel star rating, you can contact Google My Business Help to request a review of your information.